MATRIX UAB as official Synology reseller, presents information on these products. The most popular products are Synology DiskStaion DS109+, DS209+, DS409+, which are really integrated small servers, based on Linux. They have accordingly 1, 2 or 4 slots for hard disks, and are supporting RAID levels up to 5. In near future they will become popular, because of small size, quiet, silent (green) operation, and having all the server features, including e-mail server up to 30 users and print server. Synology uses PowerPC and ARM CPU in its devices. 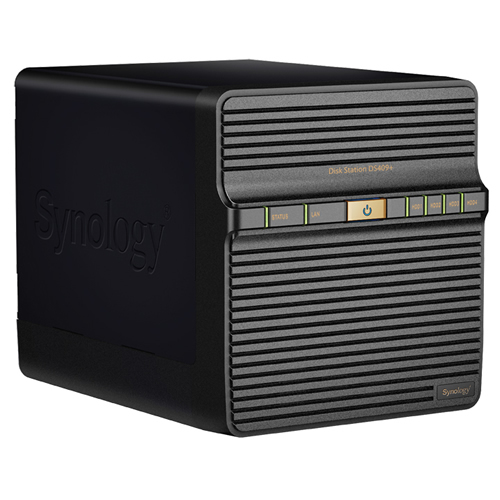 In general, most of the Synology devices have the same set of features and or capabilities (some of the lower end models do not feature the security capabilities which the higher end models have to offer, such as SSL or ADS capabilities). The differences between all of the models mainly lie in the amount of performance or storage capacities which are required by the user. All products have an Ethernet and USB port, while some models feature an eSATA port for connecting External Hard Drives. By default, users purchasing a Synology NAS do not come with Hard Drives; these will have to purchase separately. The ability of Synology’s servers evolves over time, as Synology aims to release new capabilities to each of their products. However, the primary purpose of the Synology product is to expand or supplement the storage needs of the user, using the Network Attached Storage structure. Along with expanding storage, the Synology server is capable of performing data back up purposes for Windows users, or to backup to other Synology/Rsync servers, using the RSync Protocol. Along with these basic necessities, the Synology server is capable of multimedia streaming via the UPnP protocol or it can behave as Print Server. And finally, with its integrated Apache, MySQL, and PHP engines, the Synology Server is capable of being a light-weight web server, or perhaps a small Blog server. Synology Disk Station DS109+ offers PC server equivalent performance for efficient data sharing and backup. Its high performance coupled with sophisticated Synology Disk Station Manager 2.1 provides an ideal solution for cross platform sharing, secure server backup, Windows ADS integration, business mail server, and corporate surveillance. When User Home is enabled, Synology Disk Station DS109+ automatically creates a home folder for every user account to provide each user with a private space to store data. This eliminates the need for the administrator to repeatedly create shared folders and user accounts. Synology Network Backup allows users to back up files from one to another Synology Disk Station or any rsync-compatible server, the Local Backup allows backups to external hard drives via USB or eSATA, both providing flexible scheduling options. Synology Mail Station add-on provides a one step installation and enables Synology Disk Station to be a mail server that supports Outlook-like Web mail, SMTP, POP3, and IMAP. Synology Surveillance Station 2 enables Synology Disk Station DS109+ to be an economical network video recording (NVR) solution. Over 130 popular IP cameras of varying brand names are supported. 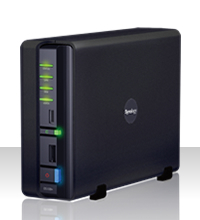 Synology Disk Station is designed and developed perpetually with the concept of energy saving. 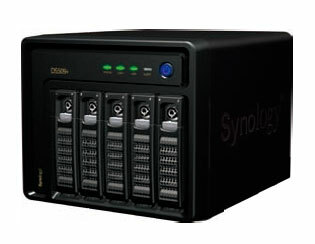 Compared with average PC counterparts, Synology Disk Station DS109+ consumes a relatively low amount of power and hibernates when not in use. This not only helps to save energy but also extends the lifespan of the hard disk. Additionally, all Synology products are produced with RoHS compliant parts and packed with recyclable packing materials. Synology recognizes its responsibility as a global citizen and is continually working to reduce the environmental impact of the products we create. Synology might not be as well known in the U.S. as other network-attached storage (NAS) device manufactures such as Buffalo, Maxtor/Seagate, or QNAP; but with Synology's announcement today of a slew of new NAS devices for small businesses and home users, Synology NAS devices might be finding their way into many more U.S. companies and homes soon. Leading off the pack of the new NAS devices is Synology's new "flagship" business-class device, the Disk Station DS509+. The DS509+ features five hot-swappable SATA-II drive bays with RAID 0/1/5/6 support. Synology claims that the DS509+ is "ideal for growing businesses looking for automated secure server backups, cross platform file sharing, mail server capabilities and a built-in surveillance system for under $1000." Synology also claims that the DS509+ is a "high-performance" NAS solution: Synology states that you can expect RAID 5 read performance at speeds greater than 55MB/Sec and RAID 5 write performance at 39MB/Sec or better. 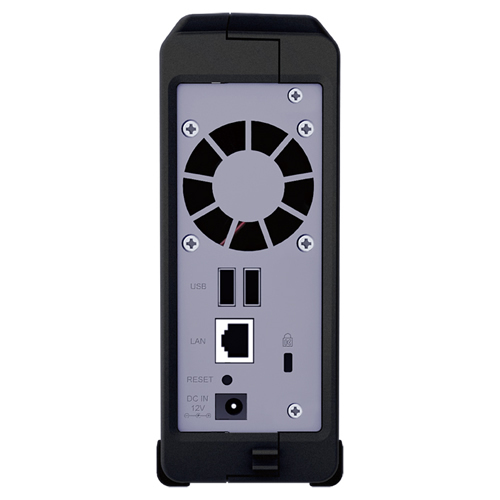 The DS509+ is powered by a 1.06GHz CPU and 1GB of RAM; it has two Gigabit Ethernet ports, two USB 2.0 ports, and 1 eSATA connection. The device supports up to a total of 7.5TB of storage space; includes CIFS, Samba, AFP 3.1, FTP, NFS, Telnet/SSH, and ADS support; it has iTunes server and UPnP multimedia streaming support; and it supports up to 2,048 user accounts, 256 user groups, 256 shared folders, and up to 512 concurrent connections. There is no word on when the DS509+ will be available, but Synology has announced that a four-drive-bay version, the Disk Station DS409+ (pictured top right), will be available in April. The DS409+ has similar specs as the DS509+--it has the same speed CPU with half the on-board memory (512MB), but it has faster rated speeds at 57+MB/Sec RAID 5 read and 41+MB/Sec RAID 5 write. There will also be another four-bay version available in April, the Rack Station RS409+, which will come in a rack-mountable 1-U format, with redundant power supplies. A single-bay Disk Station DS109+ will be available in May, and a two-bay Disk Station DS209+ will be available later in the summer. Prices have not been announced yet for these models. 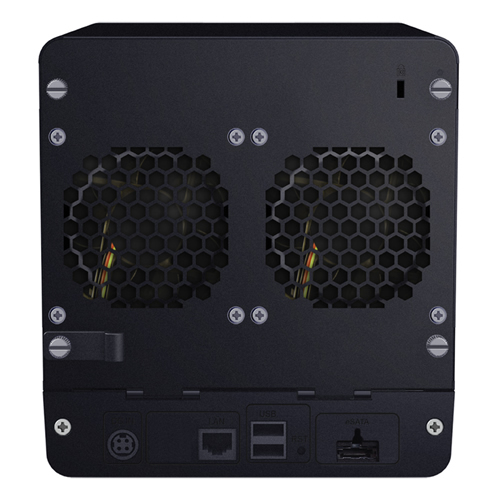 Also coming soon will be DX5 and RX4 eSATA-based expansion models. The DS409+, DS509+, and RS409+ all include built-in eSATA connections for simple scalability or dedicated backup. The five-bay DX5 is similar to the Desk Station's form factor and is meant to attach to the DS409+ or DS509+; while the four-bay RX4 comes in a rack-mountable chassis that is designed to connect to the RS409+. Synology states that connecting a DX5 or RX4 device is very simple: "One step eSATA plug-in allows the DX5/RX4 to connect to the Disk Station, and function almost immediately. No additional software installation is required." Unfortunately, Synology has not stated availability or pricing yet for these products either. Synology also has a line of "entry-level" NAS devices for home and small workgroup environments, which it is adding to with the new single-bay Disk Station 109j and the two-bay Disk Station 209j--the DS109j will sell for less than $150, and both units will be available in April. Synology states that these devices represent "an economical solution to file sharing, managing photos, streaming media, website hosting and data backup." Synology's existing entry-level "j" series includes the single-bay IDE-based Disk Station DS106j and the single-bay SATA-II-based Disk Station DS108j. It is not certain yet what new features the DS109j will bring, but the 209j will be Synology's first dual-bay NAS device for the entry-level "j" series; although the company's existing dual-bay Disk Station DS207 does appear to cater to this same market segment. Synology also recently announced the Disk Station 2.1 firmware update for its existing product lineup. The new firmware brings a number of new and improved features to existing devices, including an enhanced AJAX-based interface, mail server capabilities, support for up to two USB-connected printers, sub-folder privilege settings, and RAID migration. In addition to coming pre-installed on all new devices, the 2.1 firmware update is also available for free for existing supported models. For prices and stock see our online eshop http://www.deze.lt, or ask sales@matrix.lt. Prices and models are changing, if you want to get better price than we show in the web, ask by email.